With the changing human resource (HR) landscape in the Philippines, tech solution companies Genie Technologies, Inc. (GenieTech) and Ramco Systems are pushing to help local HR practitioners through free learning sessions. Recently, these tech companies hosted their first free seminar, in partnership with the People Management Association of the Philippines (PMAP), in a bid to help human resource practitioners in driving the employee experience of the future. Photo above (L-R): Prakash Ramnath, Director of Global Marketing and Partnerships of Ramco Systems; Mahesh Gopinath, Chief Operating Officer of GenieTech; Jeffrey John Dela Cerna, HR Head of National Grid Corporation of the Philippines; Almira Navarro, Marketing Manager of GenieTech; Pryncess Esguerra, HR Operations Director of JG Summit Holdings, Inc.; Allan Aniversario, Sales Head for Ramco HCM of GenieTech; and Sirish Krishna Pallevada, Country Manager of Ramco Systems, Philippines. 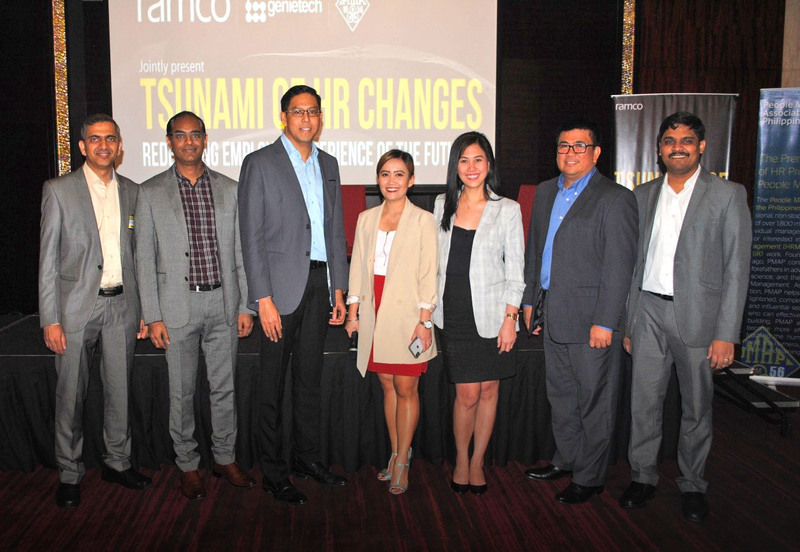 The event focused on “Tsunami of HR Changes: Redefining Employee Experience of the Future.” It gathered more than 80 HR executives and decision-makers from various organizations across Metro Manila to share valuable insights on the latest trends in HR. Aside from discussing the role of technology, other resource speakers also highlighted valuable insights and best practices in HR. Among these speakers were Eric Riego De Dios, Human Resource Director of Baker McKenzie Global Services; Jeffrey John Dela Cerna, HR Head of National Grid Corporation of the Philippines; and Pryncess Esguerra, HR Operations Director of JG Summit Holdings, Inc.
GenieTech, together with its partners, continue conducting similar free sessions in the coming months to provide a venue for HR practitioners to learn and share their insights. To learn more about GenieTech and its upcoming events, visit its website at https://www.gti.com.ph/.